7 Crafts To Make And Sell! There are a vast number of crafts to make and sell, so it can seem like an overwhelming decision if you are trying to choose the one for you and get started. To make a start, think about what your individual strengths are. Are you a whiz with a sewing machine? Do you love drawing? Is your passion folding up paper to make unique, tactile designs? No matter what it is that gets you excited about crafting, there are crafts to make and sell that will put that creative spark and passion to good use. 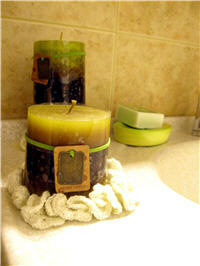 Crafts To Sell #1: Candle Crafts - Candles are always a good item to sell at tradeshows and even online. The problem you have is the same as many crafts, like jewelery. There is lots of competition. But if you make amazing candles, price them well, and use good marketing (see jewelery crafts above) you will build your business. Crafts That Sell #2: Card making - Think school arts and crafts - for grown-ups! Card making is fantastic fun and there is an incredibly diverse range of embellishments and styles of card making that you can pick from. Beautifully hand-crafted cards are in high demand and they can be customized to provide a lovely, personalized accompaniment to a gift for a loved one. From weddings to simple thank you cards, these crafts to make and sell are quite enjoyable. The problem you may face is the perceived value is not high so therefore your profit may suffer. If you have the skill to make beautiful cards, then you could find yourself being asked to make anything from proposal cards, anniversary cards to wedding invitations and more. Crafts To Sell #3: Bag making - If you're a sewing master, then bag making is a great option when looking for crafts to sell. You can combine a love of fashion and accessories with your sewing talent to make unique and one of a kind bags. Handbags, clutch bags and shoulder bags are in high demand, so this is not to be missed if you are looking for crafts to make and sell. Crafts To Sell #4: Traditional crafting - Traditional crafts such as stained glass making and basketry are experiencing a revival at the moment. For those with traditional skills who want crafts to sell, the key element to focus on is producing contemporary items using traditional techniques. 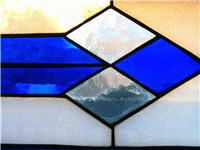 You can make and sell stained glass can be used to create beautiful tableware, lamps and wall art, as well as contemporary stained glass windows. Basketry techniques can be used to make garden ornaments, one of a kind storage solutions (much more beautiful than a plastic cube!) and even unique, handmade furniture. Crafts To Sell #5: Decorative hangings - These are really fun crafts to make and sell because there are no limits. This can include door hangers, room name plates and bunting. These are a great add on option if you make other types of craft items, as they can use up extra materials that you might otherwise go to waste. If you have loads of card, chipboard or fabric that is lying around unused, then these materials can be made into various types of decorative hangings and are simple crafts to make and sell. A personalized door hanger, door plate or bunting can add some life to a baby or child's room. Crafts To Sell #6: Custom Jewelery - Jewelery that is unique and well priced are popular crafts to make and sell. But there is a lot of competition. Your Jewelery crafts must be very unique to stand out. However, there is always a lot of room. Marketing is key here as well. For example, instead of simply laying out your jewelery with prices, have a sign that says, "Buy 2 get 1 free!" or "Buy 5 Get 1 Free". Or "Buy A Necklace and Earring Set Get A Silver Beaded Ring Free!" 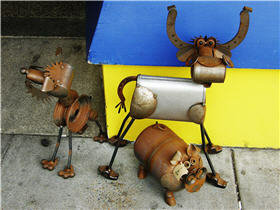 Crafts To Sell #7: Metal Crafts - Large and small metal crafts are big sellers. This requires skill in welding and/or soldering. You can make unique signs and artwork and sell them for significant prices, or you can sell tiny metal crafts like figures, cars, trucks, and motorcycles out of nuts, bolts, nails, wire, and all kinds of metal objects. It's fun, and people really like them. Metal Crafts are not a popular crafts to make and sell therefore there is room to make a profit. Learn to weld and you'll be on your way to making metalworking projects that will make you a nice income. Finding crafts to make and sell may take some time if you are just getting started, and you may want to try out some different things to see what suits your personal style and creative abilities. There are many places you can get inspiration for crafts to make and sell, from craft sites, forums and other designers; as well as from the fabrics you use, places you have visited or colors that you love. Once you find what you love and start preparing your chosen crafts to sell, it can bring a great many rewards. Here's My New Favorite Crafts To Make And Sell. You'll Like Them As Well!